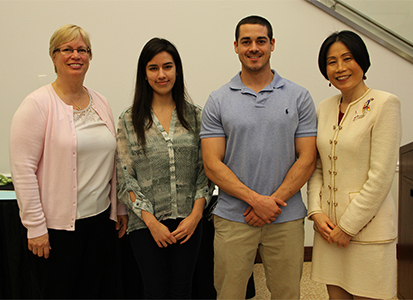 West Windsor, N.J. – Mercer County Community College (MCCC) celebrated its Educational Opportunity Fund (EOF) students at a luncheon on May 17 in the Conference Center. According to Assistant Dean of Student Services Barbara Jefferson, the director of EOF, the banquet is an opportunity for college administrators and the EOF staff to not only recognize the achievements of individual students, but also to invite family members to share in the celebration of students' growth and success. 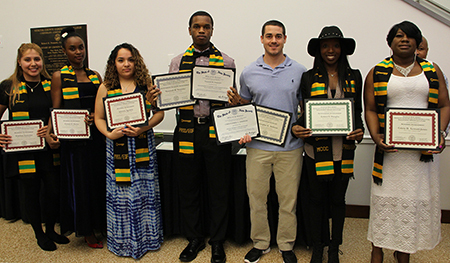 Among the top students recognized for excellence were Christopher Ambrose as Distinguished Scholar; Nayab Goraya, Nnnamdi Nnajiofor and Jordy Ruane for Outstanding Academic Achievement; Johanna Agudelo, Estefany Gonzalez, Cornett E. Davies and Colette D. Leonard-James for Academic Achievement; and Gabriel S. Douglas for Outstanding Achievement. 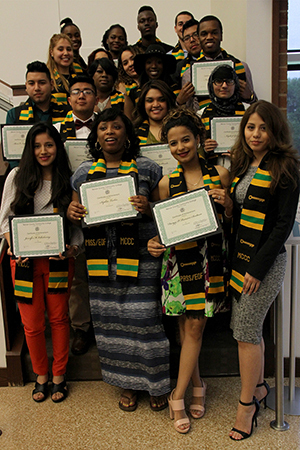 Twenty-four EOF students are members of the 2016 graduating class. Among their transfer schools are Rutgers, Bloomfield College, Montclair State, NJIT, TCNJ and William Paterson University. Said Gabriel Douglas, who served as EOF President, “EOF has been my backbone. The staff has given unconditional love. Failure has never been an option for me.” Douglas graduates with her A.S. degree in Criminal Justice. From left, EOF students selected for Govenor's Awards were Estefany Gonzalez, Cornette Davies, Johanna Agudelo, Nnamdi Nnajiofor, Christopher Ambrose, EOF Club President Gabriel Douglas and Colette Leonard-James. Leonard-James gave a student testimonial at the event about her gratitude to the EOF program and the importance of never giving up on your dreams. Members of the 2016 graduating class.